To do this click the Create New button and enter the new rule name (i.e., EAC_Block_1). Paste the first rule string above into the Match String field and click the checkboxes for Ignore Case and Fail on Match. Then click the Create Rule button. Now expand Virtual Services > View/Modify Services and click Modify for the Exchange 2013 virtual service. Click the Add New button under SubVSs. You will see a new SubVS at the bottom of the list. Click the rule None and add the EAC_Block_1 rule to the new SubVS. Be sure to click the Add button to add it. Repeat for each of the five EAC_Block rules. Click <-Back and then click the Modify button for the new SubVS. Name the SubVS Block EAC and click the Set Nickname button. Expand Advanced Properties and set the Error Code to 401 Unauthorized. There is no need to enter any real servers for this SubVS. Click <-Back and then expand Advanced Properties for the Exchange 2013 virtual service. Click the Rule Precedence button for Content Switching. You will see a list of all the rules. Click the Promote buttons to move the five EAC_Block rules so they are at the top of the list. Now when if you try to access the Exchange Admin Center using the KEMP load balancer VIP you will still be able to logon, but cannot access any of the EAC administration parts. End users will still be able to access their ECP settings from OWA. If you want to access the EAC internally, simply use the FQDN of one of your CAS servers to bypass the KEMP load balancer. 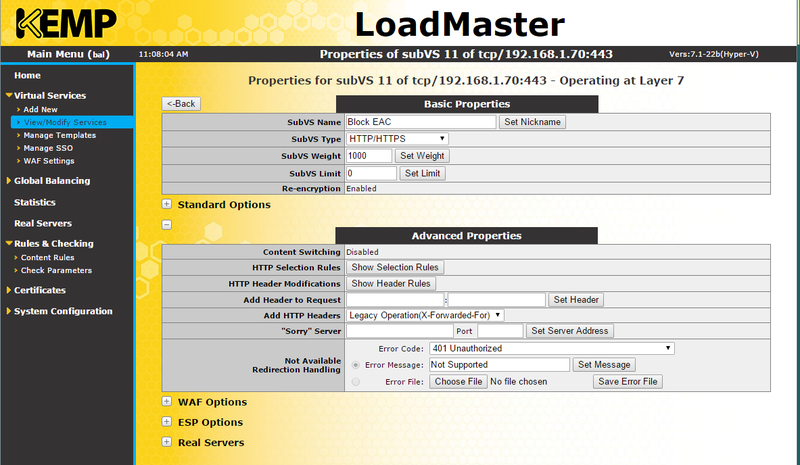 Alternatively, you can configure another virtual service for internal load balancing that does not use the blocking rules. 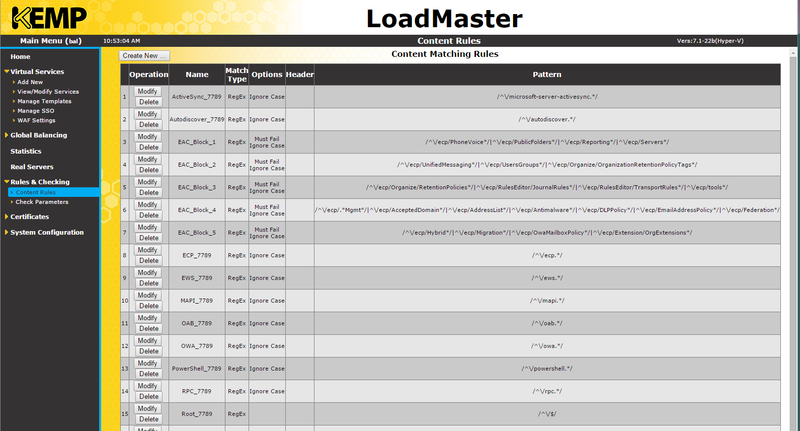 This concludes my series on configuring the KEMP virtual LoadMaster. I hope you found these articles useful.